"Porchlight ‘Merrily’ Turns Back the Clock"
Reeling in the years... let’s turn back the clock and find out exactly how we got here from there. 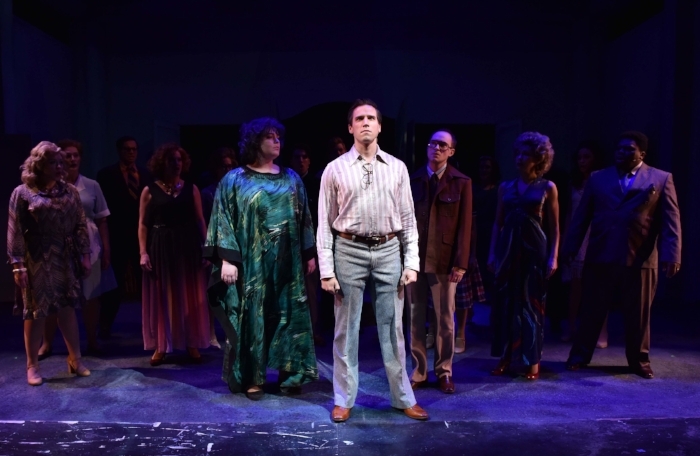 That’s the premise of Stephen Sondheim’s Merrily We Roll Along, Porchlight Music Theatre’s brilliant new offering at Ruth Page Center for the Arts. There is a lot to unravel and it’s all done with surgical skill by Porchlight Artistic Director Michael Weber and a cast that sings the daylights out of this score. What it’s about... let’s begin at the ending, shall we? Franklin Shepard (Jim DeSelm) has all the trappings of success, but no one really likes him much, including his old friend, bestselling author, admirer and alcoholic Mary Flynn (Neala Barron), his wife, Gussie (Keely Vasquez) to whom he has been unfaithful and just about everyone else at his Los Angeles pool party. Tick. Tock. Turn back the clock and Frank and Mary’s partner, Charley Kringas (Matt Crowle), frustrated and hurt by Frank’s actions, implodes on national television. Drilling down, we find that Frank’s world is fraught with temptations that ultimately ruin his marriage to his first wife Beth (Aja Wiltshire) and other twists and turns that lead, to where we all truly start out at one time or another – young, reckless and hopeful. The story of our lives... this is one of the iconic musicals that Sondheim fans savor. It is the story of our lives. 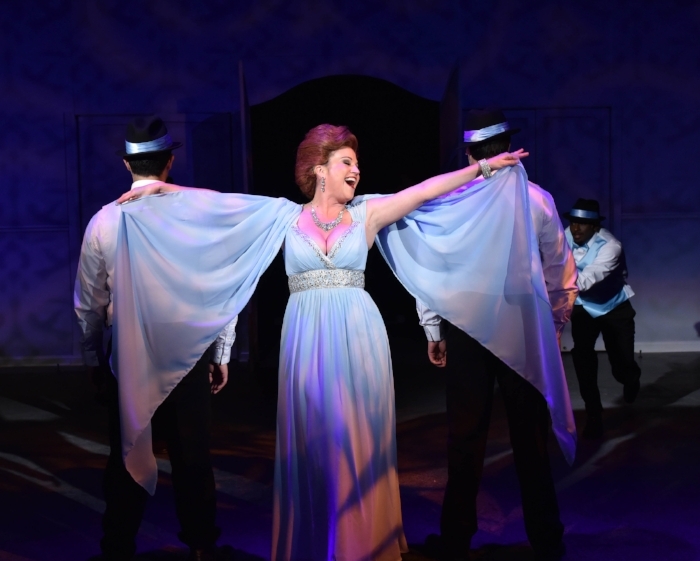 In the more than four decades that have passed since its inauspicious Broadway debut, this show continues to technically evolve with every passing year, something Weber has tapped into in an ingenious way, this being 2018 after all. It’s a clever use of media, staging and that all makes for great storytelling, or is it 'un-telling'? Who stands out... Of the three amigos in the middle — Jim DeSelm, Neala Barron and Matt Crowle — DeSelm gets the difficult assignment of being the heartless, success-at-all-costs riser you need to like and you will. Barron is a powerhouse - charming and vulnerable, with a depth of feeling that is up to everything the versatile Crowle, one of Chicago's most gifted talents, dishes out. Keely Vasquez sizzles as Gussie. And, I’ll wager we will be seeing alot more from the terrific, multi-talented Wiltshire. What life is all about... Friends like us. Damn few.